Start early, go late or take a break! It is almost impossible to arrive for park opening and stay until closing during the heat of an Orlando day. My suggestion is to plan the bulk of your park touring day focusing on getting there early before crowds are heavy, or arriving later in the day and staying until the crowds have thinned out. The bonus here is that you will do most of your touring when the heat is less intense and with fewer lines. Another option especially if you are staying on-site is to take a break in the afternoon, this is a great chance to relax at your resort pool and rest and recharge for the evening. I cannot say this enough, drink, drink, drink! We always ship a case of water to our resort so we have plenty on hand to take to the parks. You can also ask for a free cup of ice water at any quick service restaurant. If you need a boost of flavor, bring along a supply of water flavor packets, they especially come in handy for the kiddos. You may also consider setting an alarm on your cell phone every half hour or so, just to remind you to drink! It is so easy to get so lost in the magic that you forget the basics of caring for yourself and little ones. Visit a Walt Disney World Resort Water Park! Spring and Summer heat guarantee a good a time to visit Typhoon Lagoon and/or Blizzard Beach! From water slides, to lazy rivers, there is sure to be something for everyone in your family. My advice is to get there early though; the water parks tend to fill up quickly on the hottest days and on weekends. When we visit Walt Disney World Resort, we always plan an entire rest day to relax at the resort pool and hit Downtown Disney in the evening. I try to plan it for the middle of the trip when we’ll probably be in need of a break to recharge. The longer your trip, the more rest days you may need. And the hotter the weather, the more your crew will likely beg to relax at the pool. Packing pool toys for your trip is also a great idea! Recognize you won’t be able to do it all! This tip is for every trip, no matter when you visit Walt Disney World Resort. Trying to plan every minute of your vacation and attempting to visit every attraction is a sure fire way to make everyone miserable, especially when you are hot and exhausted. I always go with a general plan, but with realistic expectations and flexibility built in. Our family knows that if we miss something on this trip, there is always next time! One of our saving graces was our $7.00 CVS misting fan that August, I cannot say enough about it! They also sell ones in the parks, but at a higher cost. Also, don’t forget about the water rides in the parks, they are the perfect way to cool down in the afternoon heat. Just make sure to pack flip flops or water shoes, and consider renting a locker to hold towels and keep items dry when you need to. Did anyone say Dole Whip? What better time of year to sample an Ice Cream Mickey Bar, delicious smoothie or amazing ice cream concoction? Whatever you’re craving, Disney has you covered! 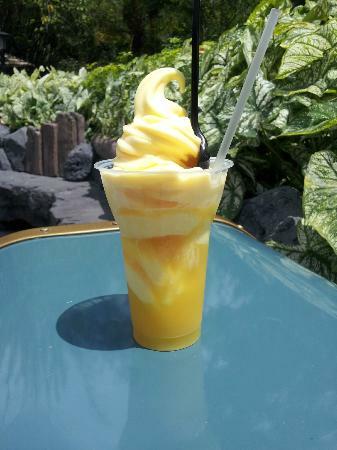 My all time favorites include the famous Dole Whip, which can be found at Aloha Isle in the Magic Kingdom Park as well as the Polynesian Resort’s Captain Cook’s. And a must have for every trip is at least one Salted Caramel Hot Fudge Sundae from Downtown Disney’s Ghiradelli Ice Cream & Chocolate Shop! You must try both of these, they are delicious! Enjoy indoor attractions, shows and restaurants! When you are touring the parks and you need a break from the heat, head to the next indoor attraction or show. Each park has several to choose from. Also, whether you chose a quick service meal or schedule an ADR (advanced dining reservation) for a table service restaurant, you may find that a break for tired feet, a tall refreshing drink and some A/C is all you need to recharge and get back to the park! My last tip would be to plan for what you can foresee, and remain calm when things don’t go your way. 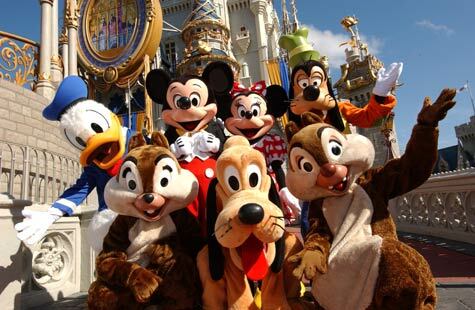 Walt Disney World Resort is the happiest place on earth, but not a perfect place on earth. Going with the expectation of a perfect vacation will surely spell disappointment. Using the tips above will surely help you beat the heat, but a cool attitude will save you from a melt-down. Whether you are visiting Walt Disney World Resort during Spring Break, Summer Vacation, or any other time of year when the heat is sure to affect your trip, going with a plan and remembering these tips will surely help you beat the heat! Enjoy and have a magical vacation!